Fontaine, Myriam and Maude-Emmanuelle Lambert. "Fête nationale du Québec (Saint-Jean-Baptiste Day)". The Canadian Encyclopedia, 23 June 2017, Historica Canada. https://www.thecanadianencyclopedia.ca/en/article/la-fete-nationale-du-quebec-saint-jean-baptiste-day. Accessed 20 April 2019. Held annually on 24 June, the Fête nationale du Québec (formerly known as Saint-Jean-Baptiste Day) has been a statutory holiday in Québec since 1925. Saint-Jean-Baptiste Day has been celebrated in North America since the early days of New France. Originally a religious celebration, it took a more patriotic turn in 1834 with Ludger Duvernay. 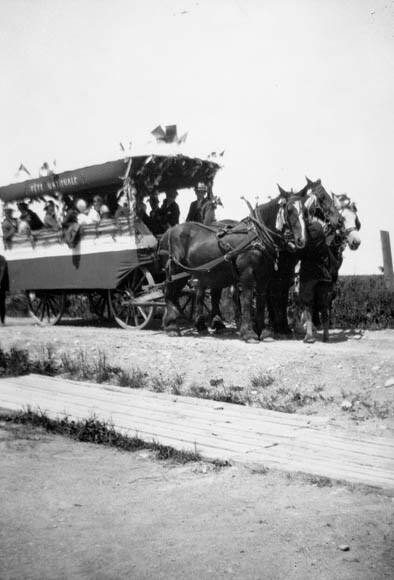 The first Saint-Jean-Baptiste Day parade took place in Montréal in 1843. 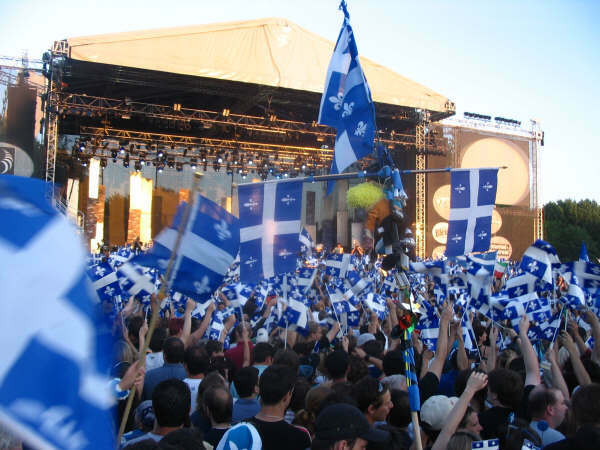 Since 1984, the Mouvement national des Québécoises et Québécois (MNQ) has organized the festivities of the Fête nationale du Québec. Various francophone communities across Canada also celebrate Saint-Jean-Baptiste Day. 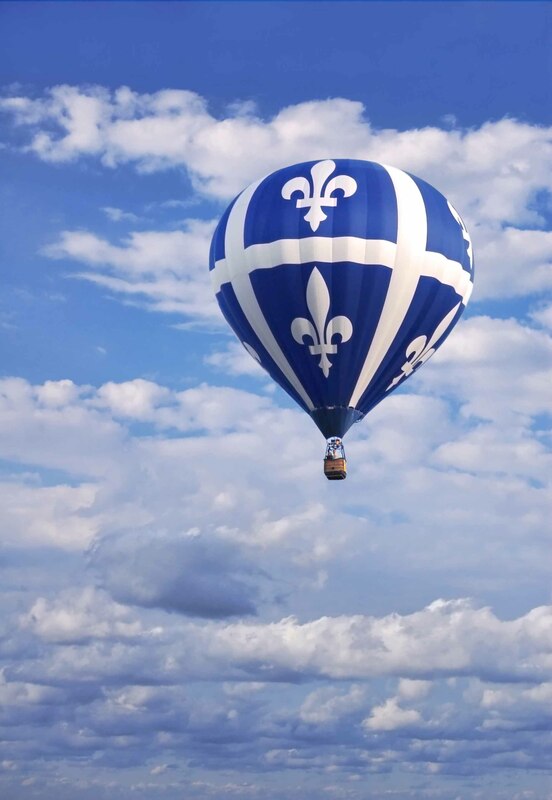 Quebec flag designed hot air balloon floating high in celebration of Saint-Jean-Baptiste day. Saint-Jean-Baptiste Day originated from celebrations of the summer solstice, an ancient pagan tradition in which fires were lit to celebrate light on the longest day of the year. In France, the Roman Catholic Church adapted this holiday and associated it with John the Baptist, cousin of Jesus. The tradition of lighting the Saint-Jean fire to mark the beginning of summer was brought to New France in 1646. In 1694, Mgr de Saint-Vallierdeclared it a public holiday dedicated to devotion. Saint-Jean-Baptiste Day continued to be celebrated after the Conquest, but it was not until 1834 that it took on the political tone it still has today. On 8 March 1834, Ludger Duvernay, editor of the newspaper La Minerve (an important publication in Lower Canada and voice of the Patriotes), founded the organization Aide-toi et le ciel t’aidera (help yourself and Heaven will help you) together with George-Étienne Cartier, then a law student, and Louis-Victor Sicotte. 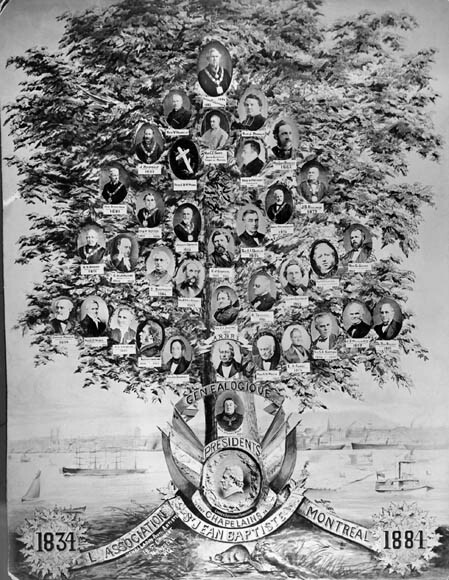 This organization, the name of which was a reference to a revolutionary secret society founded in France in 1827, foreshadowed the Fils de la Liberté and was a sort of ancestor of the Société Saint-Jean-Baptiste. The organization aimed to create a national holiday for French Canadians and organize celebrations to go along with it, similar to how the Irish in Montréal had celebrated St. Patrick’s Day with a parade since 1824. On 24 June 1834, Duvernay invited a number of prominent Montrealers to the first Saint-Jean-Baptiste banquet at the home of lawyer John MacDonnell. 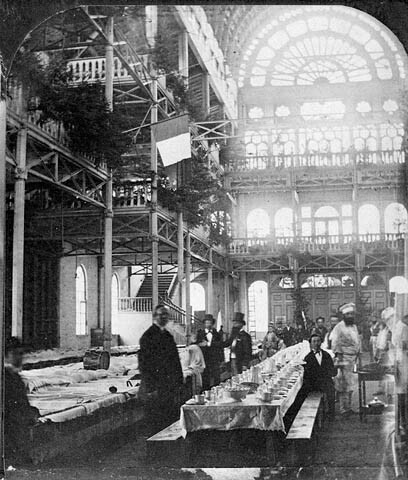 The event was above all a political affair, attended by roughly sixty francophones and anglophones (including member of the assembly Louis-Hippolyte LaFontaine, future lawyer and premier of the Province of Canada George-Étienne Cartier, mayor of Montréal Jacques Viger and Dr. Edmund O’Callaghan). Guests toasted to the Ninety-Two Resolutions, the United States, and the reformists of Lower and Upper Canada and of Ireland. In reports following the banquet, several journalists encouraged people to publicly celebrate Saint-Jean-Baptiste the following year; such celebrations likely took place in many villages. 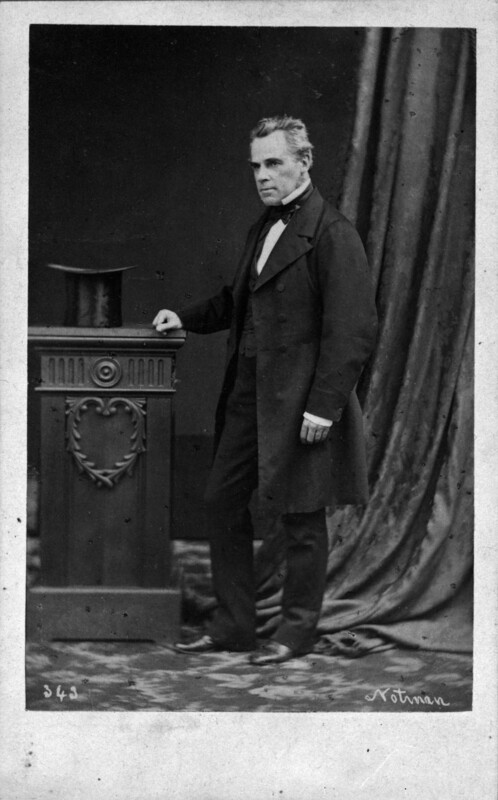 President of the Société Saint-Jean-Baptiste de Montréal since its foundation in 1834. However, the events of the 1837–1838 rebellions forced Duvernay and several other Patriotes into exile. 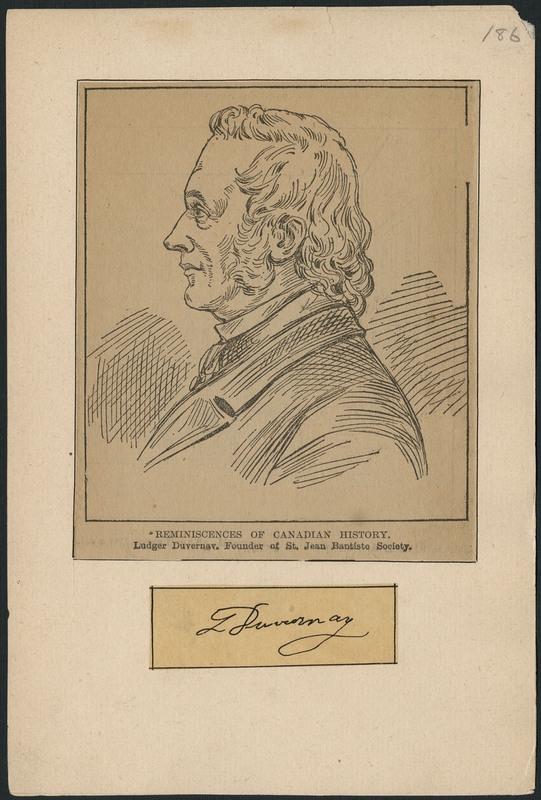 Upon returning to Canada in 1842, Duvernay quickly revived the Saint-Jean-Baptiste celebrations, emphasizing that French Canadians needed to stay united more than ever. 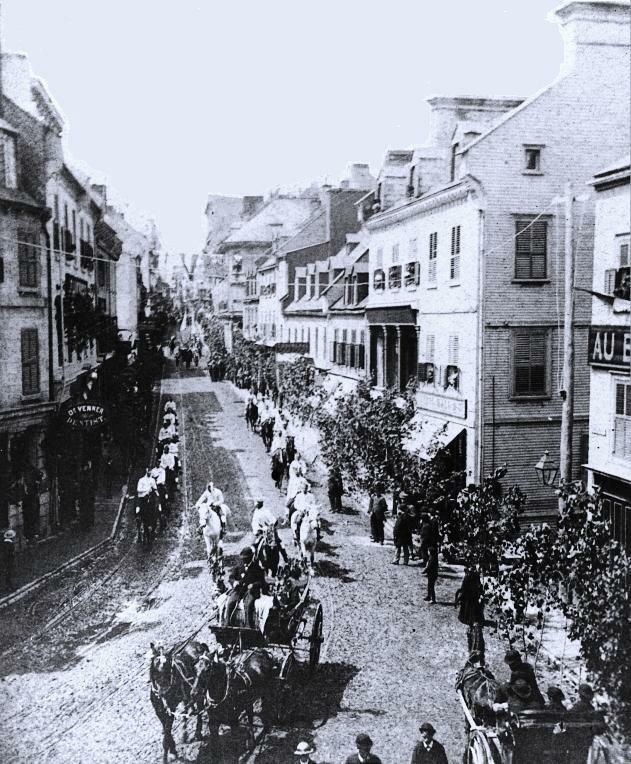 Thus, on 9 June 1843, the Association Saint-Jean-Baptiste de Montréal was created as a result of Ludger Duvernay’s efforts, and on 24 June, Montréal held its first Saint-Jean-Baptiste Day parade, a tradition that continues to this day. In the beginning, Saint-Jean festivities consisted of a banquet, a Mass, the distribution of consecrated bread and a parade. Members of Saint-Jean-Baptiste societies marched in the procession; over time, it expanded to include a variety of other cultural organizations (such as the Institut canadien), professional orders (members of the Québec Bar, physicians, etc.) and trade associations, and students. For the occasion, shops and homes displayed the symbols of Saint-Jean-Baptiste societies: the maple leaf and the beaver. The patriotic song “Ô Canada! mon pays! mes amours!” (written by George-Étienne Cartier and performed for the first time during the second Saint-Jean-Baptiste banquet in 1835), as well as the popular “Vive la Canadienne” served as national anthems for a long time. Additionally, “O Canada,” which would officially become the national anthem of the country in 1980, was heard for the first time during Saint-Jean celebrations in Québec City in 1880. 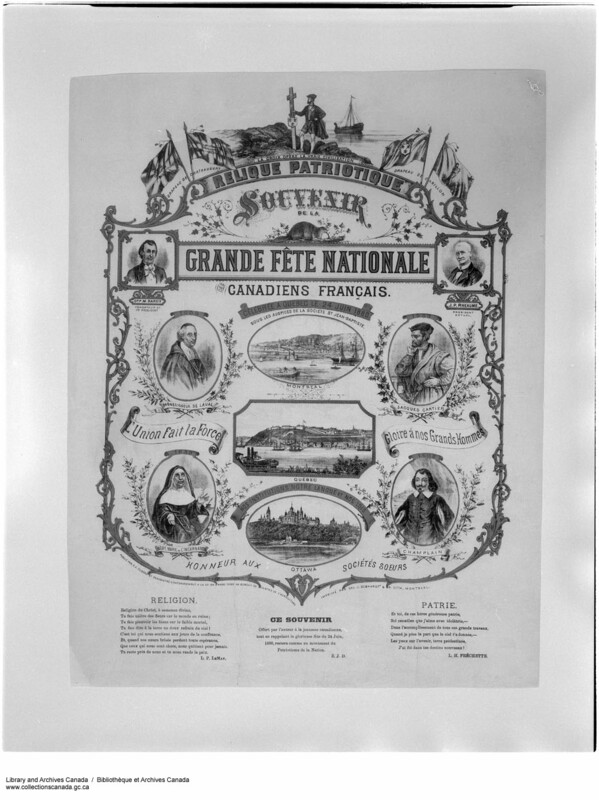 Inscription: Souvenir de la grande fête nationale des Canadiens français. Célébrée à Québec le 24 juin 1880 sous les auspices de la Société Saint-Jean-Baptiste. Given the pervasiveness of the Roman Catholic Church in French Canadian society, the holiday had a marked association with St. John the Baptist from the beginning. St. John the Baptist was personified by a curly-haired child holding a sheep in the last float of the parade. 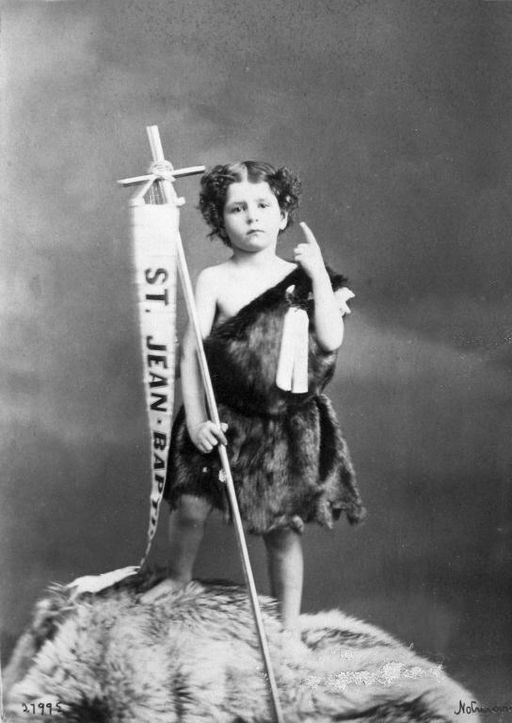 However, it was not until 1908 that St. John the Baptist officially became the patron saint of French Canadians. The figures of Jacques Cartier, a Frenchman, and an Aboriginal person, also portrayed by children, also featured in many parades in the 19th century. Over time, characters representing New France and famous Canadians were also added. 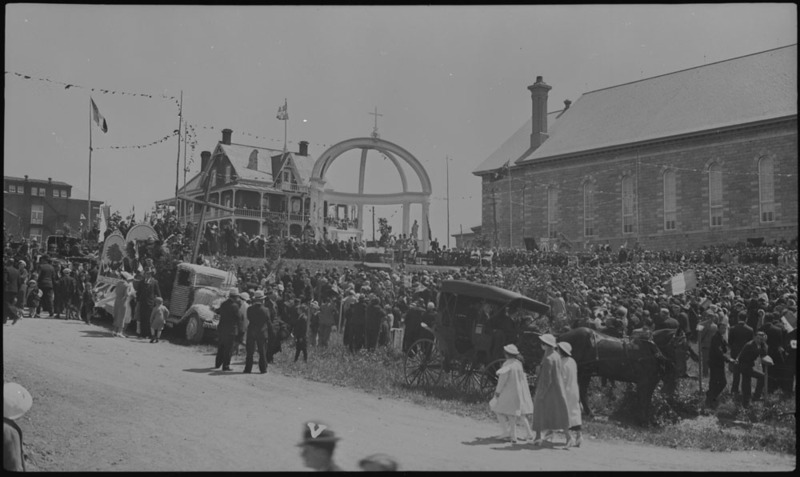 Each year, Saint-Jean-Baptiste celebrations were organized throughout the province. The largest ones, however, were held in Québec City and Montréal. Officially recognized by the Legislative Assembly of Québec in 1925, Saint-Jean-Baptiste Day became a statutory holiday that year. In 1947, the Saint-Jean-Baptiste societies of Québec formed a federation, which hastened to campaign in favour of adopting the fleur-de-lys as the province’s flag. 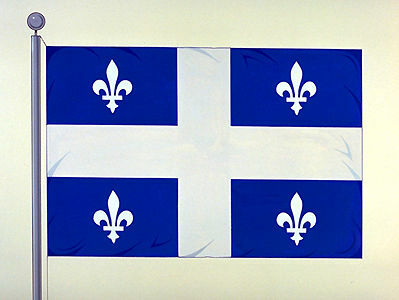 Consequently, on 21 January 1948, Québec adopted an official flag (see Fleur-de-lys) that soon became a rallying symbol in Saint-Jean-Baptiste Day celebrations. (artwork by Karen E. Bailey, courtesy Library and Archives Canada). During the 1960s and 1970s, which were turbulent years for Québec, Saint-Jean-Baptiste Day became less about religion and more focused on culture, art and unity. In June 1972, the Fédération des Sociétés Saint-Jean-Baptiste du Québec became the Mouvement national des Québécois (MNQ). The holiday, seen as a time for national unity, also served as a platform for artists and politicians. Political leaders joined the parade, occasionally causing stirs in the crowd, and sovereigntists used it as an opportunity to champion their cause. 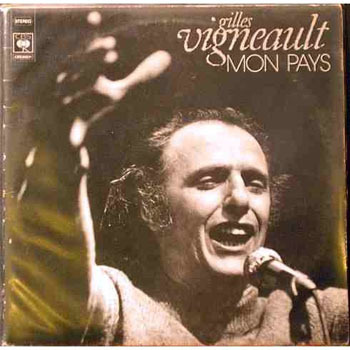 In 1975, Gilles Vigneault first performed his song “Gens du pays,” an anthem to the people of Québec that has played a key role in the holiday and in Québécois culture ever since. 1974 album cover for Mon Pays by Gilles Vigneault. 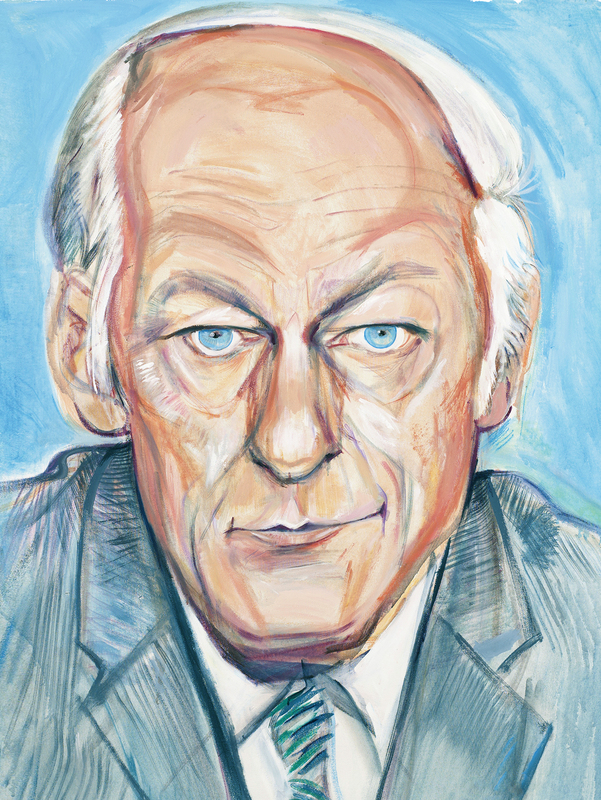 On 24 June 1977, the government of René Lévesque renamed Saint-Jean-Baptiste Day the Fête nationale du Québec, definitively distancing it from religion. 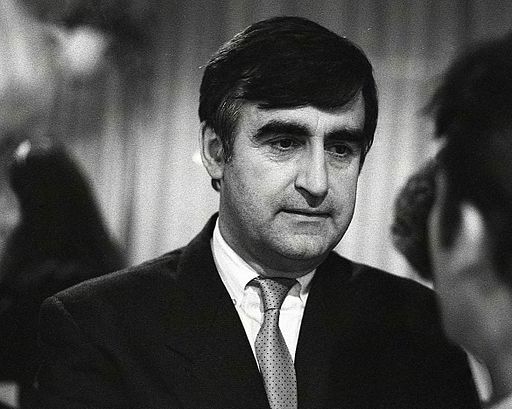 In the 1980s and 1990s, celebrations became highly politicized in the wake of the first and second referendums on Québec sovereignty (see: Québec Referendum (1980); Québec Referendum (1995)). Over time, the Fête nationale has welcomed the various communities that make up Québec society and embraced their cultural and artistic contributions. To commemorate the religious holiday of long ago, Masses are still held the morning of 24 June and during the Solstice des Nations, a traditional ceremony held as part of National Aboriginal Day on 21 June. The embers from the Friendship Fire held during the event are then used to light a large bonfire on the Plains of Abraham, in Québec City, on the night of 23 June. It is with renewed enthusiasm, year after year, that the people of Québec celebrate their national holiday with more than 750 celebrations held across the province on 23 and 24 June. Organized by nearly 20,000 volunteers, the festivities of the Fête nationale include more than 1,050 events and 360 bonfires, in addition to some of the largest public gatherings in Québec. A number of francophone communities outside Québec also celebrate Saint-Jean-Baptiste Day. It plays a large part in the annual Franco-Ontarian Festival in Ottawa and is also celebrated in Eastern Ontario, in many towns in Northern Ontario (such as Hearst and Kapuskasing), in Acadia and in several Franco-Manitoban communities. A number of British Columbian francophone associations (including those of Kamloops, Vancouver, Maillardville, Nelson and Victoria) also organize Saint-Jean-Baptiste Day festivities. Outside of Canada, Québec’s delegations in Paris, New York, London, Brussels, Mexico City and Tokyo hold celebrations as well.